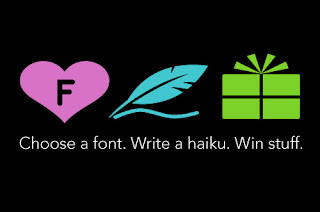 Stumbled across this haiku contest on the world wide web and loved it. Contests and competitions are are great way to stimulate your creativity and get you thinking in different ways. This one is perfect because it's great for ADs and CWs and in this age of 140 characters or less, brevity is a skill. 1. Choose your favorite Veer font. 2. Write a haiku* about the font. 3. Tweet your haiku with the hashtag #veerfonts. Each day, one winning submission will be typeset in the appropriate font, and its creator will get a Veer T-shirt. Each month, the best of all winning entries will get $250 in Veer merch. And a very covetable grand prize will be awarded to the best overall submission. Contest ends December 20, 2011. Check out some of the previous winners. * Haikus are short poems of 3 lines with the first line having 5 syllables, the second has 7 and the third has 5.